The nation's top science award - the Rutherford Medal - has been awarded to brain researcher Professor Richard Faull, of Auckland University. Professor Faull, an international expert in neuroscience, earlier this year announced findings allowing researchers to look at new ways to regenerate brain cells and repair damage to the areas of the brain affected by degenerative diseases, such as Alzheimer's. Science Minister Pete Hodgson yesterday presented the medal - awarded by the national science academy, the Royal Society - to Professor Faull at a science honours dinner in Dunedin. Royal Society chief executive Di McCarthy said the professor's research had shown that the diseased human brain could generate new brain cells. "Richard Faull's research has the potential to improve the lives of the many New Zealanders suffering from neurodegenerative diseases such as Parkinson's, Alzheimer's, and stroke," said Dr McCarthy. "In a landmark paper in Science, his team recently demonstrated the pathway new neurons travel in the adult human brain. This finding could have profound implications for prevention and treatment of neurodegenerative diseases." Two years ago, Professor Faull was awarded the Royal Society's Liley Medal for earlier research showing the human brain has the potential to repair itself by generating new neurons - a discovery with global implications. Earlier this year, with colleagues in Sweden, his team at Auckland University announced it had identified how stem cells move from the site of generation in the brain, to other areas including those affected by neurological diseases. Stem cells are immature cells that have not yet developed specific specialised functions. "We've known about the migration of brain cells in mammals for some years but humans have usually been deemed different," Professor Faull said. "Our studies show that stem cells migrate long distances through the human brain in order to replace cells that die in the olfactory system. "Utilisation of this migration may allow us to direct the stem cells to other brain regions that are affected by brain cell loss." The study looked at adult brain tissue, which means much of the brain's ability to regenerate remains active even in older human brains. Researchers have said the work is changing the way they can look at diseases where brain cells die, such as Huntington's Disease, or require repair, such as in stroke patients. 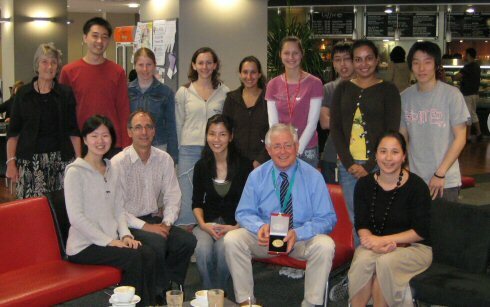 In 2005 Professor Faull was also made a Fellow of the Royal Society and was appointed an Officer of the New Zealand Order of Merit.